You’d be hard pressed to find a person who didn’t associate the words “I Have a Dream” with Dr. Martin Luther King and the struggle for African-American self-determination and equality during the Civil Rights Movement. While blacks have made significant progress, there’s a new generation struggling to achieve their own version of King’s dream. Through the DREAM Act, young immigrant men and women hope to fully participate in and benefit from America, a country they know, love, and contribute to every day. Often thought of as a Latino issue, the Development, Relief, and Education for Alien Minors (DREAM) Act is important for all of us to understand and support as we face the reality of an increasingly diverse United States of America. Introduced more than 10 years ago, the DREAM Act seeks to help place young people brought into the U.S. illegally on the path to citizenship. The DREAM Act would give undocumented students the opportunity to become U.S. citizens by enlisting in the military or going to college; this is critical for the many people who enter this country as children. 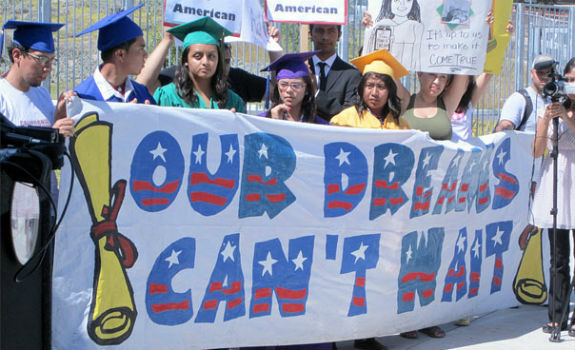 According to the DREAM Act Portal, approximately 65,000 youth do not get the chance to “test their dreams and live their American story.” For young people who have lived in this country their entire lives, this is their home – they speak English, attend school, and have community connections just like those of us born here as citizens. Because the path to citizenship can be quite lengthy and protracted, these young people have spent their entire lives with undocumented status, posing difficulties when they, like other young Americans, seek to continue their education. So what’s the deal? Why hasn’t this bill passed into law? Last week, President Obama remarked that today’s Republican party has shifted so far right, that they now condemn things they used to support as too Liberal, too Left, and too Socialist. It appears our President was right as the DREAM Act, originally a bipartisan bill, has lost support from several Republican lawmakers. Recently, we learned that Senator Marco Rubio (R-FL) is working on a new, watered-down version of the bill that dangles the carrot of citizenship yet holds it just out of reach. “You can legalize someone’s status without placing them on a path toward citizenship,” Rubio said. If that’s how he sees it, Rubio’s bill should not be considered a win for undocumented youth. Legalized status without citizenship would mean that a growing number of people would live a disenfranchised life, working, and paying taxes in the only country they have ever known but never allowed the right to vote or exercise the full rights of citizenship. It’s clear to anyone paying attention that this is all just a Republican Party ploy to curry favor with Latino voters in advance of this year’s elections. Republicans have no interest in passing legislation that benefits undocumented people living in this country but proposing the bill looks pretty good and gives candidates something to talk about when speaking to Latino voters. It doesn’t hurt that Marco Rubio is of Cuban decent and highly visible within the Republican Party. Rubio himself is dying to be vice-president and could prove attractive to any presidential candidate hoping to capture an influential voting base (See: John McCain and Sarah Palin). While there may still be some concerns with the DREAM Act, legislators should work on fine-tuning the bill in such a way that young undocumented men and women can achieve full citizenship and the rest of the country can benefit from their continued contribution. What we don’t need is a sham bill intended to sway Latino voters and create a class of nation-less people. Drake, Rihanna Cuddle For ‘Take Care,’ Lil Wayne Parties In ‘HYFR’ Videos: Watch!